Everybody has heard of Halong Bay: it is world famous since its classification as a UNESCO World Heritage Site. This means it has experienced a huge boom in mass-tourism. The thousands of tourists who pass through each year leave behind them a wreckage of litter, pollution, and over-crowded sights. These problems are becoming more and more prevalent, and savvy tourists are looking for other ways to experience the unique landscapes of the Halong area.Enter Lan Ha Bay, home to Cat Ba National Park; Halong’s quieter, more beautiful twin and neighbor. Classified as a UNESCO Biosphere Reserve, Lan Ha Bay boasts the same dramatic seascapes and towering limestone cliffs as Halong, but is comparatively undiscovered as a tourist destination. The secluded beaches are cleaner, the water sparkles turquoise, and the many local floating fishing villages are vibrant with Vietnamese culture, unadulterated by mass tourism. A paradise for nature-lovers, Lan Ha Bay is the perfect place to kayak, swim, snorkel, sail, and generally enjoy getting up close to the breath-taking scenery without having to battle through throngs of other tourists. Having been traveling and guiding people for the last 15yrs in the area, I have seen how fast Halong Bay has been pursuing unsustainable development and wholesale commercial tourism. The bay is now over-used by nearly 200 mega “5-star” junks, which weave everyday through the well-worn mass tourism routes of the once emerald waters of the Tonkin Gulf. However, in the far southern end of Halong Bay, the forgotten National Park island of Cat Ba is awakening. With its sleepy Lan Ha Bay and a multitude of beaches, caves and jungle terrains, the island is starting to change but still remains largely wild and untouched. So we at Blue Swimmer Adventure decided to pursue low-impact eco-tourism to try and do our bit to keep the island’s very special purity as long as possible by offering more green outdoor activities for nature lovers from around the world. Sometimes when travelling, you can feel like there’s nothing you can do to stop the environmental destruction going on around you. It feels all too hard and you don’t believe anything you will do will really matter or change anything. But eco-tourism in itself is a very new concept in Vietnam that needs your support to convince the authorities and other mega tourism operators that there is an alternative to McDonalds-style tourism. Once people see the value in our environment, they will do more to protect it, and that’s where you can make a difference. I believe low-impact eco-tourism has the power to change the mindsets of business people greedily pursuing profits at any cost. I believe we can all make a difference and I invite you to join Blue Swimmer Adventures in spreading the word in northern Vietnam. The Blue swimmer team try and do our best to help preserve the magic of Cat Ba and surrounding areas. All our activities are as carbon neutral as you can get, with your own body power propelling you through sea, jungles or up cliff faces. Kayaking, sailing, climbing and mountain biking – great for the environment and a hell of a lot of fun! We only use our engines on the boats in case of calm sea, timing, emergency or customer’s demand such as power on boat. We compost all our organic waste and use that yummy compost in our BlueSwimmer veggie garden. Those yummy veggies and herbs then get used in our trip meals. We minimise the amount of packaging on everything we purchase. We recycle all our bottles, cans, paper etc. We use electronic formats rather printing fancy brochures or posting out advertisements, saving heaps of trees in the process. We welcome any ideas for future action from forward-thinking, conciousness folk who have a love for the environment and a passion for adventure. If we don’t have what you want, or there’s something you’ve always wanted to do and need some help or advice, contact us and we’ll reply as soon as we can. Blue Swimmer Adventures Co. works with a collaborative approach whereby we communicate closely with you to come up with truly the best travel experience you could hope for. The artful blend of our extensive knowledge and expert travel planning experience with your expression of your dreams for your trip brings about wonderful travel experiences. Blue Swimmer Adventures Co.’s service delivery is the absolute definition of specialization and we strive to provide you with a fun, informative trip planning phase that involves as much time as you need to feel comfortable with your upcoming trip followed by a trip that exceeds your expectations in every regard. To experience our knowledge, service and refreshing approach, contact us now to start planning with Blue Swimmer Adventures. Our efforts to keep the bay clean and protect the environment of Cat Ba and Lan Ha Bay to preserve this unique world treasure. 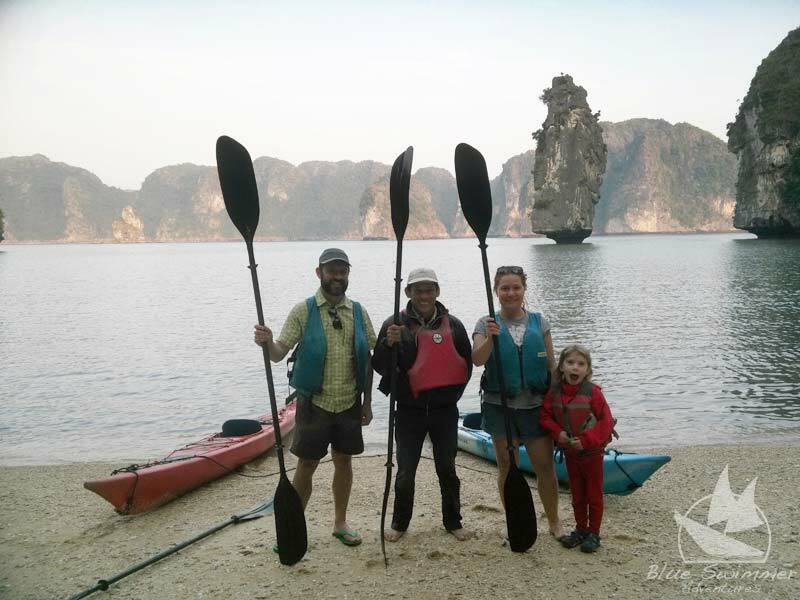 Check out what people have said about our tours on Trip Advisor and on our site to learn more about Vietnam sailing tours. We support the local community by providing jobs to local fishermen and purchase all our supplies from local producers to reduce waste.